"The people of Madina complained to `A'isha of the severe drought that they were suffering. She said: "Go to the Prophet's grave and open a window towards the sky so that there will be no roof between him and the sky." They did so, after which they were watered with such rain that vegetation grew and the camels got fat. That year was named the Year of Plenty." since she (ra) recommended to the people of Madina to use the Prophet(s) in his grave as a means of obtaining blessing and benefit and this remained in use until the Wahhabis took over the Hijaz, while "Salafis" declare this to be unacceptable. Either they know better than the fuqaha' of the Companions or, most certainly, they are peddling misguidance and innovation. * Sheikh Albani, in order to reject the hadith of Darimi, raised some objections which are so full of holes that one can not only see the sky through them, but also the sun, the moon, and the stars. (i) Sa`id ibn Zayd who is the brother of Hammad ibn Zayd is somewhat weak. al-Hafiz [Ibn Hajar] said about him in al-Taqrib: "Generally acceptable, but he makes mistakes." Dhahabi said about him in al-Mizan: "Yahya ibn Sa`id said: Weak, and al-Sa`di said: He is not a proof, they declare his ahadith to be weak. Nasa'i and others said: He is not strong; and Ahmad said: He is all right. Yahya ibn Sa`id would not accept him." 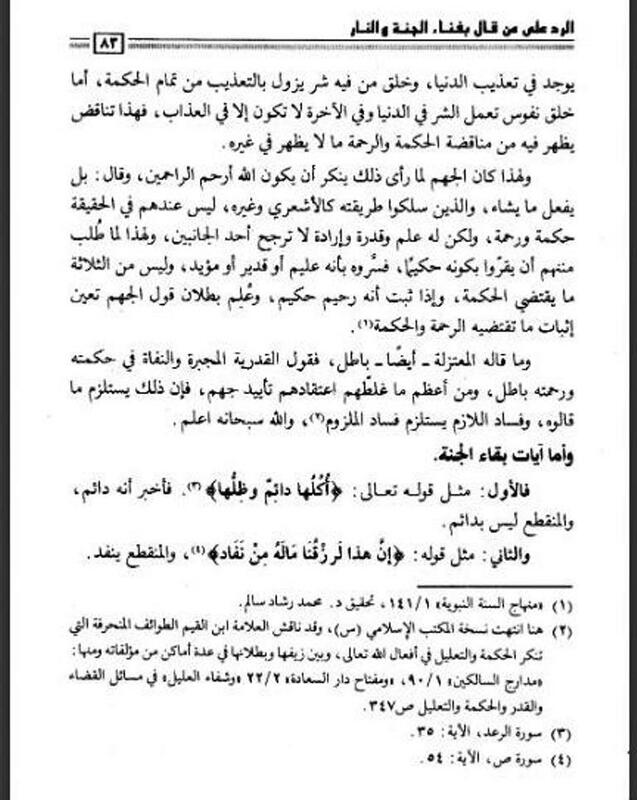 However, the above documentation is partial and biased, and this is not surprising since "Salafis" only mention what advances their view while they cover up, rephrase, or declare weak whatever contradicts it. *This is especially true of Albani, whose followers claim him as "the leading scholar of hadith of this age"(!) whereas he makes frequent mistakes, innovates in many of his rulings, and is generally unreliable except to those unschooled in the Islamic sciences. It would be more correct for "Salafis" to say: "He is our leading scholar," for in this we would agree with them completely. However, it is a fact that no one who has actual knowledge in hadith and fiqh uses Albani's books except that they check and verify anything they take from them against trustworthy scholars. The present narration is a case in point, since Albani deliberately omits to mention the authentication of the narrators he seeks to declare weak, hiding basic evidence from his readers in order to mislead them, all because he is dead set against the issue at hand, even if it is authentically reported from the Mother of the Believers! *Albani's weakening of Sa`id ibn Zayd is rejected, because Sa`id is one of Muslim's narrators, and Yahya ibn Ma`in declared him trustworthy (thiqa)! *Albani has adduced worthless proofs as is his habit when embellishing falsehood. He cited whatever fit his whim from Ibn Hajar's Taqrib, leaving out his mention that Sa`id ibn Zayd is one of Muslim's narrators in his Sahih. - Bukhari said: "Muslim ibn Ibrahim narrated to us: Sa`id ibn Zayd Abu al-Hasan narrated to us, and he is reliable and a memorizer of hadith (saduq hafiz)." - al-Duri said on the authority of Ibn Ma`in: "Sa`id ibn Zayd is trustworthy (thiqa)." - Ibn Sa`d said: "He was trustworthy." - al-`Ujli said: "He is from Basra, and he is trustworthy." - Abu Zur`a said: "I heard Sulayman ibn Harb say: Sa`id ibn Zayd narrated to us, and he was trustworthy." - Abu Ja`far al-Darimi said: "Hibban ibn Hilal narrated to us: Sa`id ibn Zayd narrated to us, and he was a memorizer of hadith and he was reliable." - Ibn `Adi said: "There is no denounced narration from him except someone else also narrates it, and I consider him one of those in the reliable category." 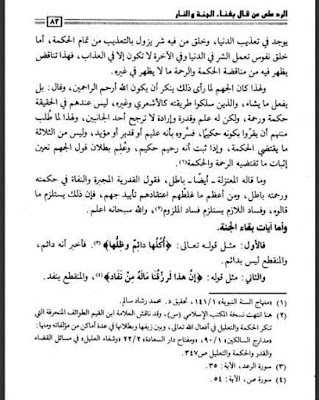 * In addition to the above remarks it is noteworthy to mention that Albani cited Ahmad's grading of Sa`id ibn Zayd as la ba'sa bihi which his translator rendered as "he is all right," but neither the author nor the translator seems to know that in Imam Ahmad's terminology la ba'sa bihi is identical with thiqa, which means "trustworthy" and is among the highest gradings of authentication! Ibn Salah in his Muqaddima (p. 134), Dhahabi in Lisan al-mizan (1:13), Sakhawi in Fath al-mughith, Ibn Hajar in Hadi al-sari, Abu Ghudda in his commentary to Lucknawi's Raf` (p. 222 n. 3), as well as the editor of Nawawi's al-Taqrib wa al-taysir (p. 51) have indicated that the equivalency of saying "There is no harm in him" with the grade of trustworthy (thiqa) obtains for many early authorities of the third century such as Ibn Ma`in, Ibn al-Madini, Imam Ahmad, Duhaym, Abu Zur`a, Abu Hatim al-Razi, Ya`qub ibn Sufyan al-Fasawi, and others. (ii) It is mawquf (stopping at the Companion), coming only from `A'isha and not from the Prophet, and even if the chain of narration up to `A'isha were authentic then it would not be a proof since it is something open to personal judgment in which even the Companions are sometimes correct and sometimes incorrect, and we are not bound to act upon that (!). To this claim it is easy to reply that not only is the narration sound and authentic, but also that there is no objection related from any of the Companions to the act recommended by the Mother of the Believers, just as there was no objection on their part to the istisqa' made by the man who came to the grave of the Prophet in the narration of Malik al-Dar cited below. This shows ijma` on the matter on the part of the Companions, and such ijma` is definitely binding in the sense that no one can declare unlawful or innovative something which they have tacitly declared lawful or desirable. As for the following the opinion of the Companions we say what Imam al-Shafi`i said as related by Ibn Qayyim in A`lam al-muwaqqi`in `an rabb al-`alamin (2:186-187): "Their opinion for us is better than our opinion to ourselves." (iii) Abu al-Nu`man... was originally a reliable narrator except that he deteriorated at the end of his life. The hadith master Burhan al-Din al-Halabi mentions him among those who deteriorated in later life in his book al-Muqaddima (p. 391) and he says: "The ruling about these people is that their narrations are accepted if reported from them by people who heard from them before they deteriorated. But narrations reported from them by those who heard from them after they deteriorated, or narrations reported from therm by people about whom we do not know whether they heard from them before they deteriorated or after, then these narrations are to be rejected. "I say: We do not know whether this report was heard by Darimi from him before or after his memory deteriorated, it is therefore not acceptable and cannot be used as evidence. [Footnote:] Shaykh al-Ghumari missed this weakness in Misbah al-zujaj (p. 43), just as it was ignored by another in order to give the impression to the people that this report is authentic(!). His weakening of Abu al-Nu`man is invalid, because Abu al-Nu`man's deterioration did not affect what is narrated from him! al-Daraqutni said [as cited by Dhahabi in Mizan al-i`tidal (4:81)]: "He deteriorated at the end of his life, and no denounced hadith issued from him after his deterioration whatsoever, and he is trustworthy (thiqa)." As for what Ibn Hibban said, that "Many denounced things occurred in his narrations after his deterioration," then al-Dhahabi refuted it when he said (4:8): "Ibn Hibban was unable to cite a single denounced narration from him, and the truth is just as Daraqutni said." Shaykh Muhammad ibn `Alawi al-Maliki said in his book Shifa' al-fu'ad bi ziyarat khayr al-`ibad (p. 152): Abu al-Nu`man's deterioration neither harms nor is detrimental to his reliability, since Bukhari in his Sahih narrated over one hundred hadiths from him, and no narration was taken from him after his deterioration, as Daraqutni said.... The chain of transmission is all right, in fact I consider it good. The scholars have cited as evidence many chains that are like it or less strong than it. *We know full well that it is Albani who betrays scholarly trust and deliberately misinforms the people, even if he accuses others of disinformation.... In weakening Abu al-Nu`man he has again acted faithlessly. His quotation from al-Burhan al-Halabi's book al-Ightibat bi man rumiya bi al-ikhtilat (p. 23) is designed to pull the wool over the eyes of his followers and those who only read his works! For it is necessary to also know that those who are branded as suffering from deterioration in the aforementioned book are divided among those whose narrations were unaffected by their deterioration and those whose narrations were affected. Abu al-Nu`man belongs to the first group, and al-Dhahabi made this clear in al-Mizan (4:8). Therefore our reply to Albani is: Shaykh al-Ghumari did not miss anything concerning this matter of deterioration, because he is a hadith scholar and a master memorizer (hafiz), however, it is you who have missed it, O slandering backbiter! * As for Albani's quotation of Ibn Taymiyya's claim in his al-Radd `ala al-Bakri (p. 68-74) whereby "a clear proof that it is a lie is the fact that no such opening existed above the house at all in the whole of the life of `A'isha"(!) then it is a weak objection which is no sooner brought up than cast out. Surely Imam al-Darimi and the scholars of the succeeding generations would know of such a detail better than latecomers. *As for the authorities among the latter, then the hadith scholar and historian of Madina Imam `Ali al-Samhudi (d. 922) did not so much as look at Ibn Taymiyya's objection, rather he confirmed the truth of Darimi's narration by saying, after citing it in his Wafa' al-wafa' (2:549): al-Zayn al-Miraghi said: "Know that it is the Sunna of the people of Madina to this day to open a window at the bottom of the dome of the Prophet's room, that is, of the blessed green dome, on the side of the Qibla." I say: And in our time, they open the door facing the noble face (the grave) in the space surrounding the room and they gather there." `Abdullah ibn Dinar said: "I heard Ibn `Umar reciting the poetic verses of Abu Talib: A fair-skinned one by whose face rainclouds are sought, A caretaker for the orphans and protector of widows. A fair-skinned one by whose face rainclouds are sought,A caretaker for the orphans and protector of widows.One sub-narrator added: "These were the words of Abu Talib." *Note that in his translation of Bukhari (2:65), Muhammad Muhsin Khan alters the wording of the hadith to read: "A white person who is requested to pray for rain" in place of "by whose face rain is sought," and Allah knows best the reason for this grave betrayal of the translator's trust in the most important Islamic source after the Qur'an. 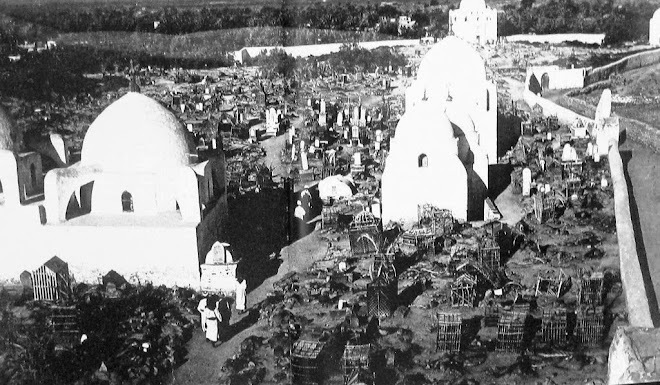 The famine gripping the people of Medina ended through the mediation of the Prophet’s grave. Heavy rains created a spring scenario all around. Men found their food and the animals found their fodder. 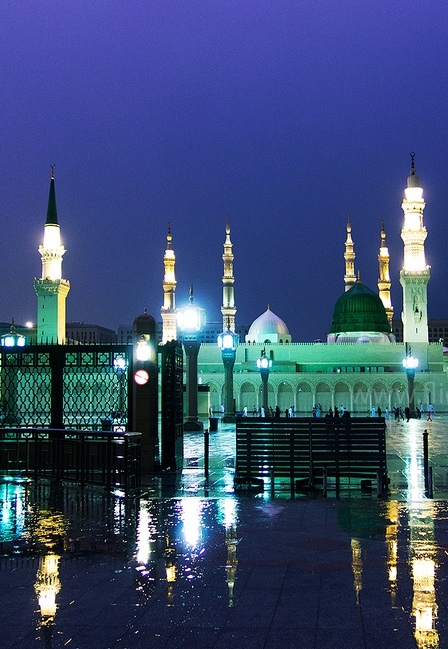 And the rain that came about as a result of the Prophet’s mediation made the lands of Medina greener and more fertile and on account of over-harvesting, they named the year as the year of greenery and plenty. Those who deny the conceptual relevance of intermediation have raised some objections against this tradition. One of the objections is that its chain of transmission is weak and so it cannot be offered as an argument. 1. 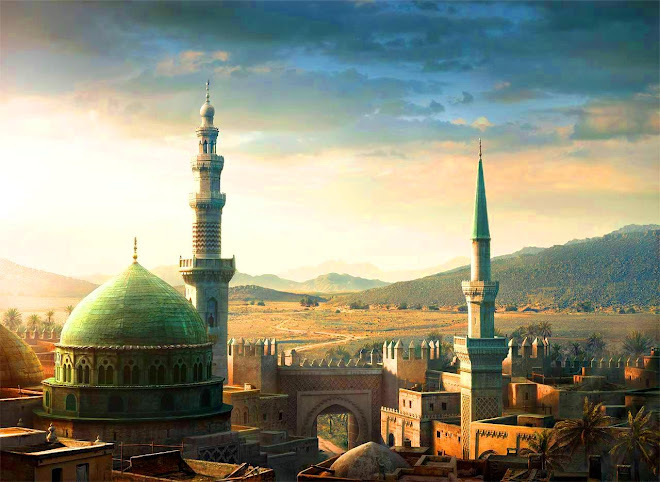 The name of Abū an-Nu‘mān ‘Ārim was Muhammad bin al-Fadl Sadūsī. They agree that he was a reliable reporter of traditions as is confirmed by Dhahabī in Mīzān-ul-i‘tidāl (4:7): “He was Imam Bukhārī’s teacher, memorizer of traditions and an extremely truthful person.” But their objection is that he had lost his marbles in the declining years of his age. 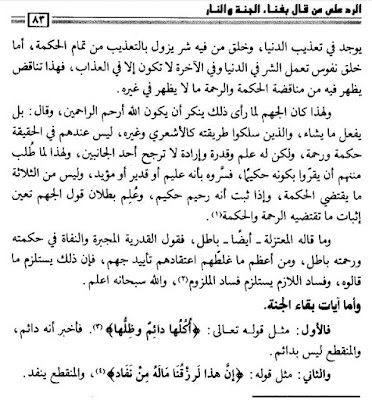 Burhān-ud-Dīn Halabī, who possessed great knowledge of traditions, comments in his book al-Muqaddimah on this reporter along with others who had lost their memory in the closing years of their lives: “The ruling on these narrators is that the traditions reported by them before their loss of memory are acceptable, while the traditions after their deranged conditions are unacceptable. And if we do not know whether these traditions were received from them before or after their memory lapse, we should not accept these traditions from them either.” The objectors say that since we do not know whether Abū an-Nu‘mān has narrated this tradition before or after his loss of memory, we cannot adduce the tradition as evidence. *This objection not only lacks significance but also lacks credibility. Their objection is logically inconsistent. While they discard this tradition as weak, because it is the product of his loss of memory, they ignore other traditions though they are also the products of the same state of mind. Dhahabī says: ‘Imam Dāraqutnī comments, “Though he had lost his memory towards the end of his life, he never reported any tradition in this condition that could affect his veracity, therefore, he remains a truthful narrator.’ I insist that it is a report by that contemporary memorizer of traditions who is only matched by Imam Nasā’ī.” Ibn Hibbān is of the opinion that there are many incompatibilities in Abū an-Nu‘mān’s narrations after his loss of memory but Dhahabī rejects this opinion by asserting that Ibn Hibbān has failed to produce a single fact that establishes him as a misreporter of traditions. And the real position is the one that has been endorsed by Imam Dāraqutnī. ‘Irāqī has admitted in at-Taqyīd wal-īdāh that Imam Dhahabī has convincingly rebutted Ibn Hibbān’s statement. Dhahabī has explained it in al-Kāshif (3:79) that the change took place before death, but after the change he had not related any tradition. Ibn Hajar ‘Asqalānī writes in Taqrīb-ut-tahdhīb (2:200) that Abū an-Nu‘mān was a sound narrator and the change came about in his last years. 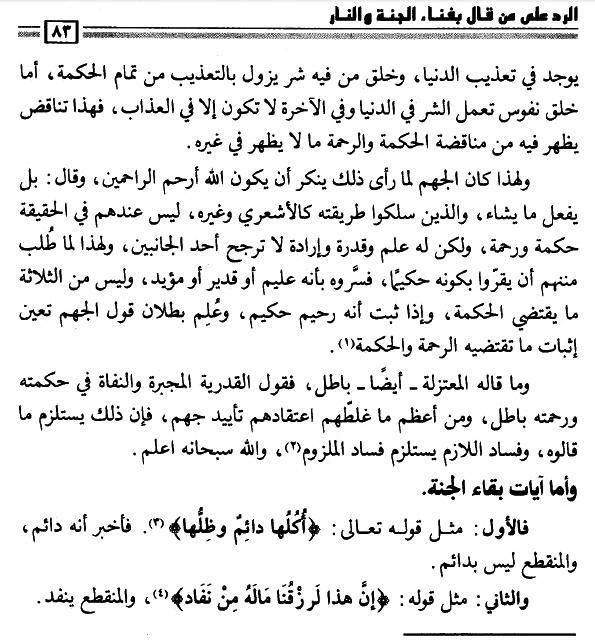 Besides Imam Bukhārī, Imam Ahmad bin Hanbal, Ibn Abū Hātim Rāzī and Abū ‘Alī Muhammad bin Khālid Zarīqī have also heard traditions from Abū an-Nu‘mān before his mental confusion set in. Imam Dārimī is one of the well-reputed teachers of Imam Bukhārī and other famous memorizers of traditions. Therefore, it was impossible for him to accept any tradition from Abū an-Nu‘mān after he had suffered a loss of memory. Dhahabī negates it in al-Kāshif (1:286). He says that the decrepitude attributed to Sa‘īd bin Zayd is incorrect because Imam Muslim accepted traditions from him and Ibn Ma‘īn has called him authentic and trustworthy. “Imam Bukhārī said that Muslim bin Ibrāhīm reported to us that Sa‘īd bin Zayd Abū al-Hasan is extremely truthful and knows the traditions by heart. “Dūrī has reported it from Ibn Ma‘īn that Sa‘īd bin Zayd is a trustworthy narrator. “Ibn Sa‘d has also called him a reliable narrator. “‘Ujlī comments that he belongs to Basrah and he is a dependable relater of traditions. Abū Ja‘far Dārimī said: Hibbān bin Hilāl reported to us that Sa‘īd bin Zayd has related to us that tradition and he is truthful and a preserver of traditions. The famous compiler and exegete of traditions ‘Abdullāh bin Muhammad bin Siddīq al-Ghumārī from Morocco writes in his book Irghām-ul-mubtadī al-ghabī bi-jawāz-it-tawassul bi an-nabī writes: “Imam Ahmad bin Hambal has referred to Sa‘īd bin Zayd as laysa bihī ba’s. It means that there is no objection against him and he is absolutely truthful. Imam Ahmad’s expression is semantically identical with trustworthiness, which is considered the highest virtue by all traditionists of integrity. Ibn Ma‘īn also identifies the term laysa bihī ba’s with trustworthiness. 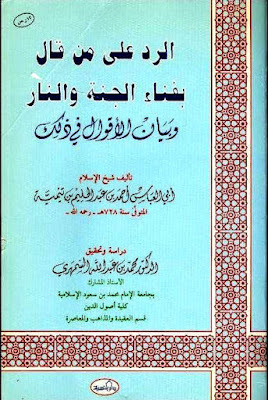 The traditionist Ibn-us-Salāh in al-Muqaddimah, Sakhāwī in Fath-ul-mughīth, Ibn Hajar ‘Asqalānī in Hady-us-sārī muqaddimah Fath-ul-bārī and Nawawī in at-Taqrīb wat-taysīr have identified laysa bihī ba’s with veracity. Besides, a number of traditionists of the third century (ah), for instance, Ibn Ma‘īn, Ibn Madīnī, Abū Zur‘ah, Ibn Abū Hātim Rāzī, Ya‘qūb bin Sufyān Fasāwī, etc., have invested laysa bihī ba’s with the distinction of veracity. The word sadūq (truthful) used by Ibn Hajar ‘Asqalānī attests to the veracity of ‘Amr bin Mālik an-Nukrī and he has given it precedence over others. Mahmūd Sa‘īd Mamdūh refers to it in his book Raf‘-ul-minārah (p.258) that ‘Abdullāh bin Ahmad, attributing it to his father, commented, “Annahū ka-annahū da“afahū (as if he weakened him).” I say that the word ka-anna (as if; as though) is doubt and suspicion; it cannot serve as an act of justification. When ‘Abdullāh bin ‘Alī bin Madīnī referred to Hasan bin Mūsā Ashyab as wa ka-annahū da“afahū (and as if he weakened him), Ibn Hajar ‘Asqalānī endorsed him by saying: hādhā zann, la taqūmu bihī hujjah (it is suspicion, therefore, it cannot serve as a justification). So this statement makes the veracity of ‘Amr bin Mālik an-Nukrī unquestionable. Dhahabī has explained it further in Mīzān-ul-i‘tidāl (3:286) and al-Mughnī (2:488). *Albānī writes in Ta‘līq ‘alā Fadl-is-salāt ‘ala an-nabī (p.88): ‘Amr bin Mālik an-Nukrī is a reliable narrator as has been endorsed by Dhahabī. He has also confirmed this view in another book Silsilat-ul-ahādīth-is-sahīhah (5:608). 4. A large number of people have taken traditions from Abū al-Jawzā’ Aws bin ‘Abdullāh on the basis of his credibility and the direct transmission of this tradition from ‘Ā’ishah has also been established. In support of this contention it suffices to state that Imam Muslim has recorded Abū al-Jawzā’ Aws’s narration through ‘Ā’ishah. It was related to us by Musaddad who had heard it from Ja‘far bin Sulaymān, who from ‘Amr bin Mālik an-Nukrī who had reported it from Abū al-Jawzā’. He said: I spent twelve years with Ibn ‘Abbās and ‘Ā’ishah and there was not a single verse of the Holy Qur'an about which I had not asked them. I lived as Ibn ‘Abbās’s neighbour for twelve years and there was not a single verse of the Holy Qur'an about which I had not asked him. And my deputy visited the Mother of the Believers (‘Ā’ishah) every morning and evening. So I did not hear from any other quarter (except what I heard from her), nor did I hear from any other source (except from her) what Allah has enjoined about sin that I shall forgive him (the sinner) except the one who associates any partner with Me. According to Ibn Hajar ‘Asqalānī, it by no means implies that he never met ‘Ā’ishāh afterwards. So, the inference drawn by Imam Muslim from the frequency of visits clearly indicates that he had a face-to-face meeting with ‘Ā’ishah. Thus when his meeting with ‘Ā’ishah has been established with irrefutable finality, the element of deceit and incredibility in his statement is automatically washed out and his tradition, therefore, acquires authenticity. To call him an impostor is, actually, to commit excess against his genuineness as a reporter, and to do him justice we have to acknowledge the obvious fact that his statement is based on sound transmission. This conclusion is compatible not only with the findings of Imam Muslim but also reflects the general drift of public opinion. Abū Nu‘aym has confirmed the authenticity of a number of traditions by Abū al-Jawzā’ with the words ‘an ‘Ā’ishah (from ‘Ā’ishah) in Hilyat-ul-awliyā’ wa tabaqāt-ul-asfiyā’. Ibn-ul-Qaysarānī has also reported a tradition from Abū al-Jawzā’ by using the words sami‘a ‘Ā’ishah (he listened to ‘Ā’ishah). This detailed discussion proves beyond doubt that these certificates of authenticity are not based on any forgery but on verifiable evidence, and this chain of transmission is sahīh (sound) or hasan (fair). Muhammad bin ‘Alawī al-Mālikī says, “This tradition has a good chain of transmission; rather, in my opinion, it is sound. The scholars have also acknowledged its soundness and have established its genuineness on the basis of almost equally credible evidence. Therefore, this tradition may be relied upon as a viable argument because, according to Imam Nasā’ī’s contention, a narrator may be discarded only when all the traditionists have unanimously rejected him/her. Those who deny the relevance of intermediation object to the tradition as undependable as its range of reference is limited only to the Companion and does not extend up to the Prophet ( صلى الله عليه وآله وسلم ) himself. In their opinion, it is only one of ‘Ā’ishah’s statements and not a command to be indiscriminately followed. They add that, even if it carries the stamp of her certification, it cannot serve as cogent argument as it is based on personal opinion, which is generally characterized by fluctuation. Sometimes the personal opinion of a Companion may prove correct but at other occasions it may prove incorrect. Therefore, its application is not binding on the believers. These traditions reflect the collective opinion of the Companions and such a consensus is quite valid. An act, which enjoys the tacit support of the Companions, cannot be spelled out as invalid or a discredited form of innovation, and it is obligatory for us to follow the Companions. In this context, Imam Shāf‘ī says, “For us, their opinion about us is far more authentic than our own opinion.” This tradition clearly establishes the fact that ‘Ā’ishah commanded the natives of Medina to rely on the Prophet ( صلى الله عليه وآله وسلم ) in his grave as a source of intermediation for divine blessings. Ibn Taymiyyah has discarded the tradition as mere fabrication. According to him, during the entire life of ‘Ā’ishah, there was no such hole in the roof of the Prophet’s tomb. But this objection is weak as watered tea because Imam Dārimī and the religious leaders and scholars who followed him were more deeply aware of these details. For example, a traditionist and historian from Medina, ‘Alī bin Ahmad Samhūdī has disconfirmed Ibn Taymiyyah and supported Imam Dārimī’s contention. According to him, Zayn-al-Mirāghī said, “Let it be known that it is a practice of the people of Medina to date that, during a period of drought, they open a window at the bottom of the dome in the Prophet’s tomb in the direction of prayer niche though the roof intervenes between the grave and the sky. I say that in our period, too, one of the gates in the boundary wall, enveloping the tomb, called al-mawājahah, that is, the door that opens towards the Prophet’s face, is flung open and people gather there (for prayer). The Ottoman Turks followed the practice of offering prayers through the mediation of the Prophet’s grave. The practice remained in vogue till the early years of the twentieth century. Whenever there was famine and scarcity of rain, the residents of Medina persuaded a six-or-seven-year-old child to climb the roof of the grave. (He performed the ablution before climbing over the roof.) The child tugged at the rope, which had been hung down the roof to close the hole in the grave, dug at the suggestion of the Mother of the Believers, ‘Ā’ishah. When there was no curtain between the sky and the grave, it started raining.
. Dārimī related it in his Sunan (1:43#93); Ibn-ul-Jawzī in al-Wafā’ bi-ahwāl-il-mustafā (2:801); Subkī in Shifā’-us-siqām fī ziyārat khayr-il-anām (p.128); Qastallānī in al-Mawāhib-ul-laduniyyah (4:276); and Zurqānī in his Commentary (11:150).
. Muhammad bin ‘Alawī al-Mālikī, Shifā’-ul-fu’ād bi-ziyārat khayr-il-‘ibād (p.152).
. ‘Irāqī, at-Taqyīd wal-īdāh (p.462).
. Ibn Sa‘d, at-Tabaqāt-ul-kubrā (7:287).
. Imam Ahmad’s statement has been reproduced by Dhahabī in Mīzān-ul-i‘tidāl (2:138) and by Ibn Hajar ‘Asqalānī in Tahdhīb-ut-tahdhīb (4:32).
. Ibn Hajar ‘Asqalānī, Lisān-ul-Mīzān (1:13).
. Ibn Hajar ‘Asqalānī, Hady-us-sārī muqaddimah Fath-ul-bārī (p.397).
. Mahmūd Sa‘īd Mamdūh, Raf‘-ul-minārah (pp.259-60).
. Ibn S‘ad, at-Tabaqāt-ul-kubrā (7:224).
. Abū Na‘aym, Hilyat-ul-awliyā’ wa tabaqāt-ul-asfiyā’ (3:79).
. Ibn-ul-Qaysarānī, al-Jam‘ bayn as-Sahīhayn (1:46) as quoted by Mahmūd Sa‘īd Mamdūh in Raf‘-ul-minārah (p.261).
. Muhammad bin ‘Alawī al-Mālikī, Shifā’-ul-fu’ād bi-ziyārat khayr--il-‘ibād (p.153).
. Ibn Hajar ‘Asqalānī, Nuzhat-un-nazr bi-sharh nukhbat-ul-fikr fī mustalah hadith ahl-ul-athr (p.89).
. This tradition will be discussed later.
. Ibn-ul-Qayyim, A‘lām-ul-muwaqqi‘īn ‘an rabb-il-‘ālamīn (2:186). Therefore, while it is deduced that Hellfire will pass away with The Book, The Sunna, and the words of The Companions, those who say that Hellfire will remain forever have no evidence from The Book, The Sunna, and the words of The Companions. Source: Ibn Taymiyya, Al-Radd 'ala man qala bi-fana' al-janna wa al-nar. ed. Muhammad b. 'Abd Allah al-Simhari (Riyadh: Dar al-balansiyya, 1415/ 1995). "Ibn Qayyim has a second opinion according to which Hellfire will never end. Ibn Taymiyya has a book refuting those who say Janna [Paradise] and Jahannam [Hell] will cease to exist. At that time [20 years ago] I thought that Ibn Taymiyya shared this second opinion of Ibn Qayyim. The author al-San`ani, with what he has quoted from Ibn Qayyim, explains that the above mentioned refutation [written by Ibn Taymiyya] is not against those who say Hellfire will end, but it is against the jahmis who say Paradise will cease to exist and he [Ibn Taymiyya] states that Hell will cease to exist. 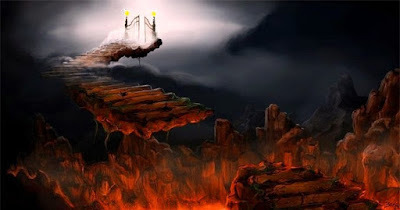 Moreover, he does not state only this, but states also that the people of Hell will enter paradises with rivers flowing under them after Hell ceases to exist." "fana al-nar" (that Jahannam will come to an end) was the Final Recorded/Written Position of Ibn Taymiyya. Furthermore, Note: this position continued to be defended by his loyal student Ibn al-Qayyim even after Ibn Taymiyya's death. For example, Ibn al-Qayyim completed the composition of al-Hadi in the year 745 A.H. (1344-45). Ibn Taymiyya died in 728AH/1328CE. "As one of his false beliefs, he [Ibn Taymiyya] has stated: Hellfire will end." Janna and Jahannam have been created; they will not ever cease to exist. People who commit great sins among the umma [community, believers] of Muhammad (sallallahu ta'ala alayhe wa sallam) will not abide in Hellfire forever, provided that they die as Ahl al-Tawhid [as monotheists, i.e. as Muslims]. This includes even the unrepentant that, nonetheless, died as believers knowing Allahu ta'ala. They are in His judgment and decree. If He wishes, He forgives and pardons them by His grace, as He mentioned in His book (4:48). Or if He wishes, He punishes them in Hellfire by His justice, and then removes them by His rahmat [mercy, grace], (or) through the intercession of His obedient servants. He then sends them to His Janna [Paradise]. But please note that there are also some places in his books where he mentions that Hellfire will NOT end. A Salafi may try to defend him by mentioning that. But at best, his statements are contradictory on a clear cut issue where that is not allowed. No where did he explicitly says that he was of one opinion and changed his mind for us to know what his final position was. So we are left with his contradictory statements in his book “Fanaa Al Jannah wan Naar” and the statements of his TOP student Ibnul Qayyim in “Haadil Arwaah” and “Shifaa’ul ‘Aleel” and what their contemporaries have affirmed about them on this issue.